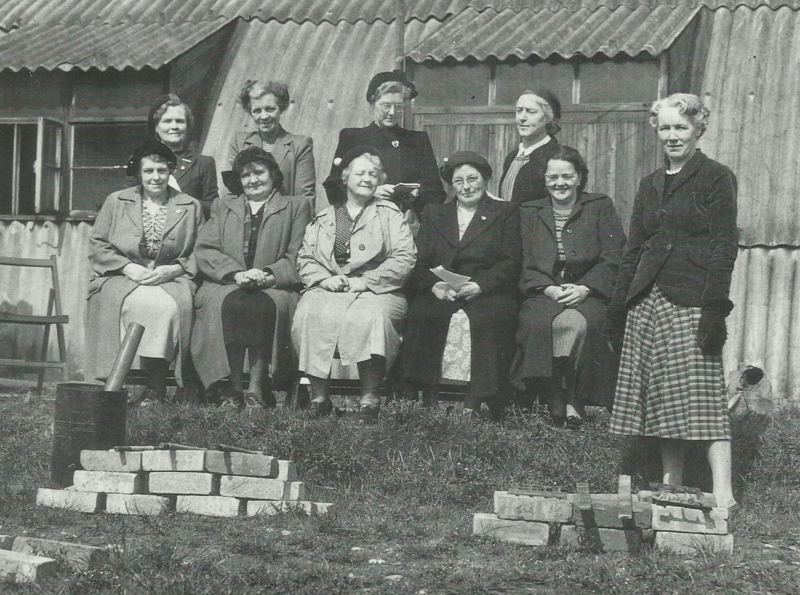 Brownhills Womens Voluntary Service group photo in 1943. What do you know? From ‘Memories of Walsall’ by Alton Douglas. An email finds me from David Evans, containing a rather wonderful image he’s spotted in an Alton Douglas book that he’s like to know more about – it surely is a cracker and I’d love to know more about these ladies and what they were up to. I’m quite excited about it, because it has the potential to shed more light on Wartime Brownhills, a period that seems to be curiously barren in the historical record. I’m always wary of images from this series of books, as sometimes the captions are not as well researched as they could be, so please do feel free (as ever) to correct any details. My thanks to David again. He really is turning up some cracking stuff at the moment. 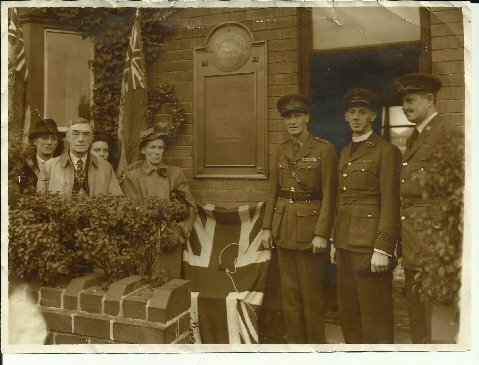 Some while ago you kindly published the photo of a British legion plaque in your article ‘Can anyone help Bill‘. One of the ladies in that photo was deduced to be a Mrs. Parsley in her fine hat (see the comments). The conversations arising from that photo revealed that Mrs. Parsley was an important member of the local wartime WVS as an area organiser. It also came to light that there was a ‘British Restaurant’ , a sort of temporary hut that stood near the Central Boy’s School (Annexe), in Brownhills during the war. The above image appears on page 16 of ‘Memories of Walsall’ by Alton Douglas, published in 1990, with the legend ‘Demonstration of outdoor cookery by WVS members, Brownhills, 1943’. From conversations with friends recently I think we can now add much more information. The building is indeed the British Restaurant, and was a temporary building. Mrs. Parsley is the lady standing on the extreme right of the group, and Mrs. Nancy Bradbury is standing on the left. I wonder if your readers can help to identify the other ladies in this group, please? Maybe shed some light on the British Restaurant? So, what do you know? Comment here or BrownhillsBob at Googlemail dot com. Cheers. Bill Mayo’s picture showing Mrs. Parsley in her finest hat and Sunday Best. This entry was posted in Brownhills stuff, Clayhanger stuff, Environment, Events, Followups, Fun stuff to see and do, Interesting photos, Local History, Local media, News, Reader enquiries, Shared media, Shared memories, Walsall Wood stuff and tagged 1943, Alton DOuglas, British Restaurant, Brownhills, Brownhills local history, Clayhanger, David Evans, Local History, Memories of Walsall, Mrs Parsley, Nancy Bradbury, New Photos, Outdoor Cookery, Staffordshire, Things to do, Walsall Wood, war, WRVS, WVS. Bookmark the permalink. Today there are some 800 British restaurants in operation, and the plans for 300 more been approved. Over 170,000 meals are served daily; and they are good substantial meals of plain but well cooked food, the prices ranging from about 8p to 1 shilling. They are patronised not only by those who have lost their homes, but by the factory worker who has no canteen, and by the busy mother employed on war work, who has little time to spare to cook for a husband and family. It is only necessary to ask these people what they think of the British restaurants to realise the important part of this new development in catering is playing in maintaining the war effort. On Wednesday evening a meeting organised by the Brownhills Woman’s Voluntary Service was held in the Brownhills Wesley School. An address was given by Mr Godfrey Basley, from the Ministry of information, on the subject of “Digging to Victory” and the importance of growing food in gardens and allotments so that every available ship could carry the war materials that are so urgently needed. This was followed by talk from Mr DA Dempster, of Rodbaston Farm, who gave hints on the technical side of the subject, and afterwards answered many questions asked him by members of the audience. There was a good attendance, including practically all the members of the Council…. If it’s the Mrs Parsley I’m thinking of, I think she used to live in the old mill house at the bottom of Mill Road, off Ogley Road.